It’s this time of year when I especially like to make bloody marys. School is out and our schedule is more relaxed. We have those beautiful Minnesota weekend mornings to sit outside on the back deck, soaking in that precious sun that left us longing all winter long. 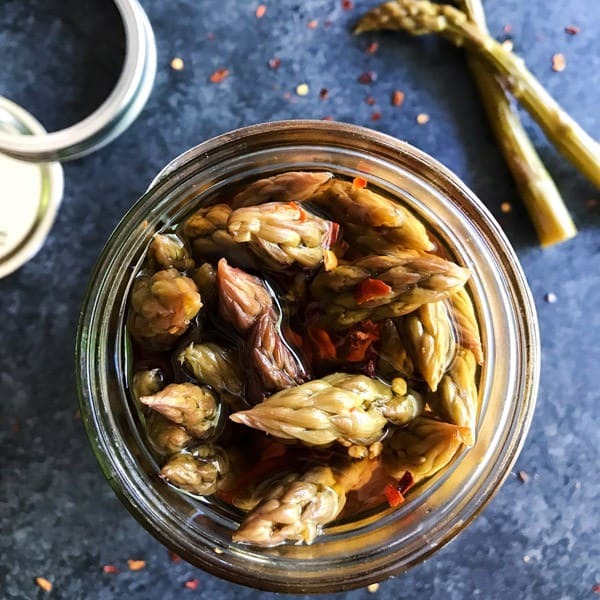 And it’s this time of year when I usually have a fresh batch of homemade pickled peppered asparagus on hand, waiting for its moment of glory in a loaded bloody mary. 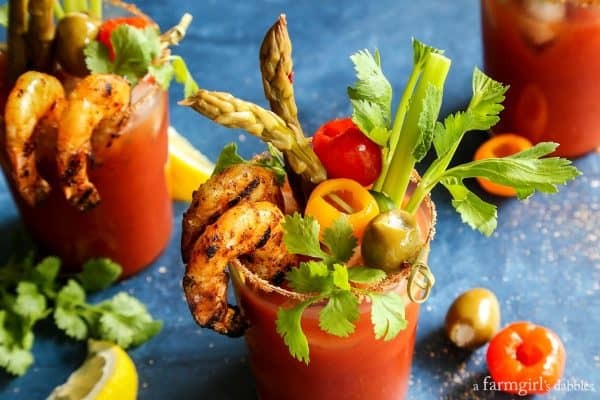 I’ve recently been working on upping my bloody mary game and am super thrilled to share with you my 5 Pepper Bloody Mary with Grilled Jalapeño Shrimp. It is AWESOME good! * This is a sponsored post, created in partnership with Master of Mixes®. 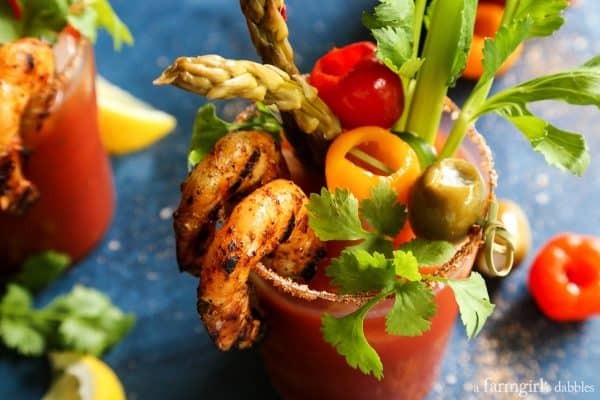 A really great bloody mary is loaded with all good thinks pickled and peppered. 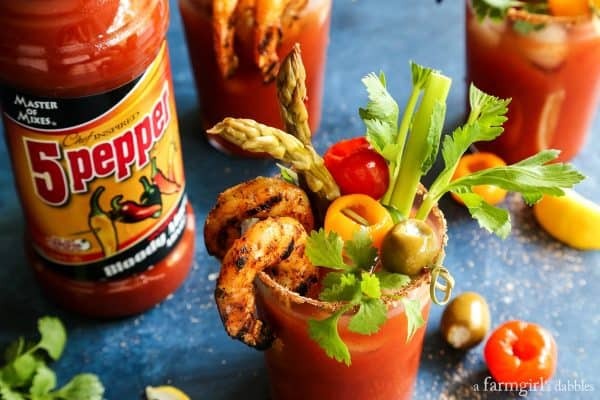 I marinated a dozen jumbo-size shrimp in a fresh jalapeño mixture and then threw them on the hot grill for this 5 pepper bloody mary with grilled jalapeño shrimp. 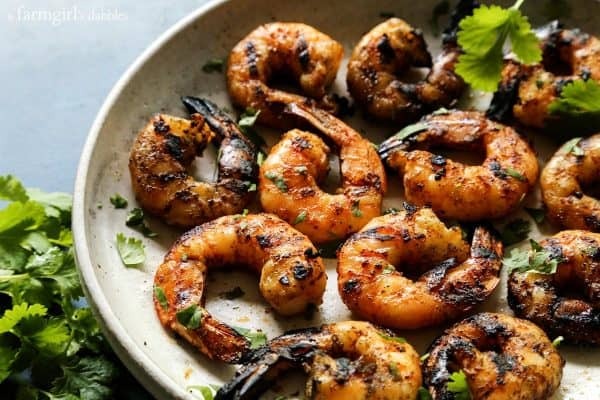 The little bit of brown sugar in the marinade helps to caramelize the shrimp’s exterior, giving wonderful flavor and beautiful char marks. I wouldn’t blame you one bit if you doubled the grilled jalapeño shrimp portion of this recipe, just so you could sit and nosh on shrimp. Actually, I highly recommend it. It’s what I do. I find the process for preparing the garnishes and bloody mary rim salt to be both creative and fun. 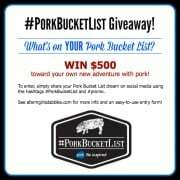 I’m looking for color and flavor and texture, and there is an endless variety of options out there. 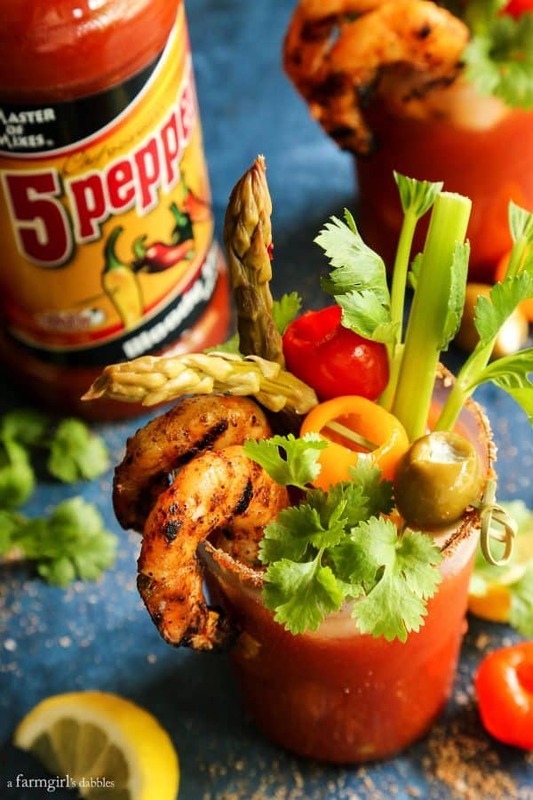 I personally prefer a little kick with my bloody mary and knew that the 5 Pepper Bloody Mary Mixer was the one for me. It’s loaded with tongue-tingling pepper warmth. LOVE. 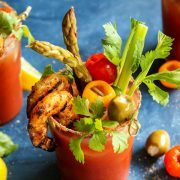 If you’re looking for more cocktail inspiration using these bloody mary mixes, MixologyPro.com is a great resource —> just type “bloody mary” in the search bar on the lefthand side, and you’ll be greeted by a nice assortment of bloody mary drink recipes. Place shrimp in a wide shallow bowl and set aside. In a small bowl with high sides, combine all ingredients from olive oil through black pepper. Using an immersion blender, completely process until there are no sizable pieces. Or use a food processor or blender. Pour marinade over shrimp and gently stir to coat evenly. Cover and refrigerate for 2 to 3 hours. Heat grill to medium-high. Make sure grates are clean, and then oil them well. Set shrimp on hot grates and grill for 2 to 3 minutes per side, or just until shrimp are no longer opaque and have some nice char. 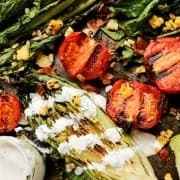 Remove from grill. Run the cut edge of a fresh lemon wedge around the rim of your glass. Invert glass and dip rim into a small plate of prepared bloody mary rim salt. Turn glass upright and add 5 Pepper Bloody Mary Mixer and vodka. Give a little stir. Carefully add ice cubes to nearly fill glass. Top with freshly ground black pepper. Hook a couple of the grilled jalapeño shrimp on the side of the glass. Then garnish with a stalk of fresh celery, pickled peppered asparagus, peppadews, and stuffed green olives. Or any of your own favorite garnishes. I like to use little bamboo skewers to thread on garnishes. For more than 40 years, Master of Mixes has hand-crafted authentic cocktail mixes that allow you to enjoy beautiful, quality cocktails at home. 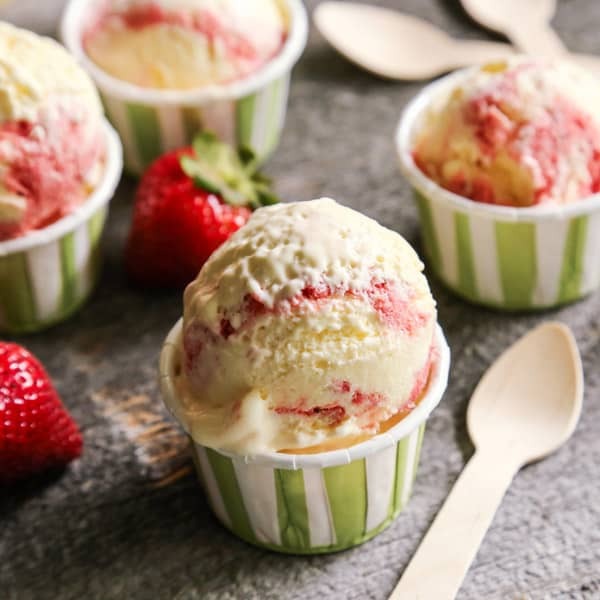 By staffing a full-time Food Scientist, who travels to 15 countries and more than 20 fruit farms every year, they are able to ensure the very best products. Visit Master of Mixes on Facebook and Instagram for even more cocktail inspiration. This post was created in partnership with Master of Mixes. All text and opinions are mine. Thank you for supporting the brands that help make this site possible. I know I can’t drink the booze out of these – but I want every little drop of everything else!! Incredible! I can leave the vodka out for you. Still good!! 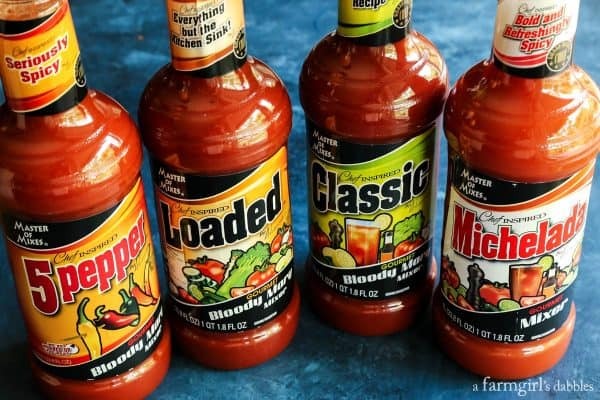 I always go back and forth on Bloody Marys… but this one has all of my favorite ingredients. That shrimp looks divine! I am with you on this, Brian. I want to see one before I’ll order one in a restaurant. But at home…you can do whatever you want. GRILLED SHRIMP, peppadews, and pickled peppered asparagus for the win. I love all the garnishes. Looks tasty! Cheers! Thanks, Bird – Happy Weekend! I am all over this! I would make a triple batch of those shrimp though and put them on EVERYTHING! We always make extra grilled shrimp. They are a weakness of mine!! Thanks Alyssa. The shrimp in this is AMAZING! I could sip these all day! Feel free to totally line your glass with grilled jalapeño shrimp! Glory! 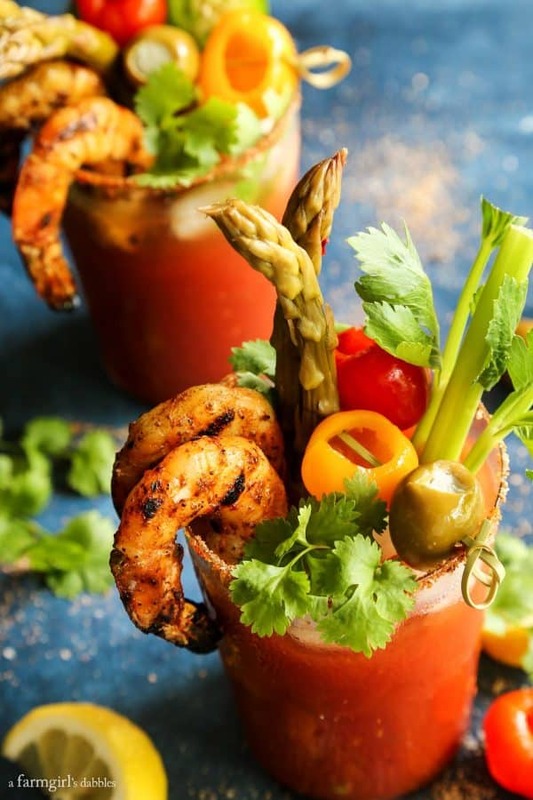 This looks amazing — and I wish all Bloody Mary’s came with grilled shrimp! I know! It’s a bloody Mary game changer. Thanks, Kelly! You took the Bloody Mary to a whole new level with this, love it! This is jaw-droppingly awesome! Well done! We went out to dinner last night and when the waiter asked what I wanted to drink all I could think of was a Bloody Mary and wow, it was spicy and delicious. 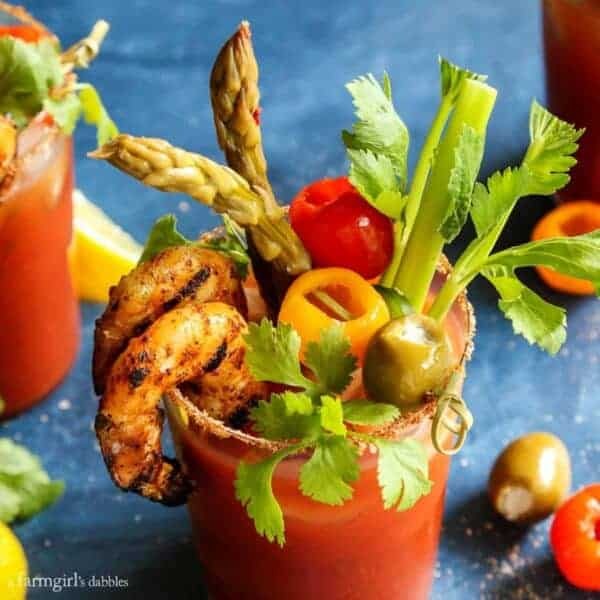 Thank you for sharing all your recipes for bloody Marys!! You have inspired me to make my own!!! Thanks Wendy. 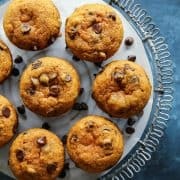 These are a great make-at-home bevvy!